This package consists of a short pre-flight briefing conducted in the classroom, or the aircraft, followed by a 30 minute introductory flying lesson with a qualified flight instructor. You will get a chance both to fly the aircraft and to enjoy the view. Price includes the services of the instructor, landing fees and insurance and the hire of the aircraft. 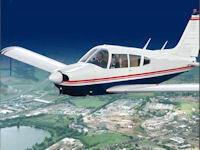 Should you decide to learn to fly, this lesson will count towards your Private Pilots Licence. Once you get the 'flying bug' you can progress to the full PPL (Private Pilot's Licence) course. As long as you are reasonably fit, there is no age limit. There is a recommended maximum height of 6 ft and weight of 17 stone (although do please let us know if you are over 14 stone). If you are outside these limits we recommend that you pay a little more and fly in a four seater aircraft: it will certainly be more comfortable that way!